For quantitative determination of aconitase enzyme activity and high-throughput screening assays for aconitase modulator. ACONITASE (ACONITATE HYDRATASE) is an enzyme in the citric acid (TCA) cycle that catalyzes the conversion of citrate to isocitrate. The activity of aconitase depends largely upon the iron-sulfur [Fe4S4] 2+ cluster. Related diseases include aconitase deficiency (e.g. myopathy and exercise intolerance), Friedreich’s ataxia and diabetes. BioAssay Systems’ aconitase assay measures the isocitrate generated as a product of the aconitase reaction. The isocitrate is then oxidized producing NADPH and the oxidation product. The NADPH converts the dye to an intense violet color with an absorption maximum at 565 nm. 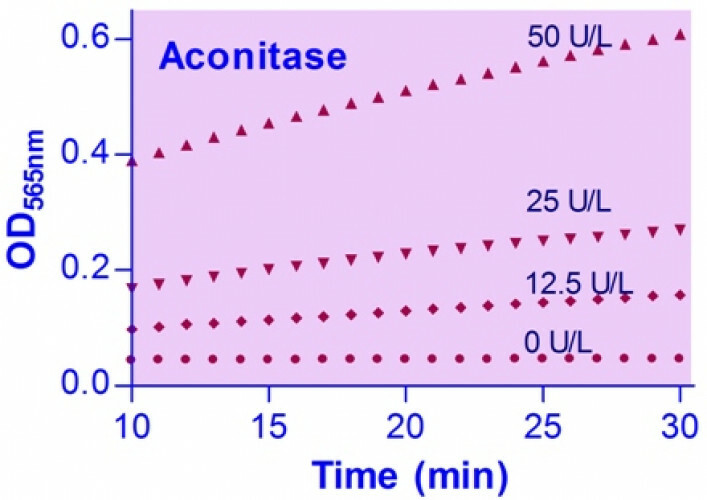 The increase in absorbance at 565 nm is directly proportional to aconitase activity. Applications For quantitative determination of aconitase enzyme activity and high-throughput screening assays for aconitase modulator.